Not long ago I made Chocolate Chocolate Waffles and topped them with Hot Peanut Butter Fudge Sauce. My family ate them up, and I’ve been experimenting with breakfast food and chocolate ever since. But, that chocolatey sauce drizzled over waffles is what made me think of making this Mint Chocolate Ganache recipe. Well, that and the carton of mint chip ice cream sitting in my freezer. We all get our inspiration somewhere, right? My recent concoctions: Mint Chip, Very Berry Chocolate Chip, and Almond Poppy Seed. I decided that since I was making so many waffles, it would be a lot easier if I made a homemade Waffle Mix that I could divide up over the course of the week to mix with various wet ingredients and make some AWEsome waffles. It worked. The Mint Chip Waffles deserved an equally minty topping… so I decided to whip up some Mint Ganache. Now… I could have used straight chocolate and added some mint extract, or gone all out and used an herb. Instead, I used what I had in my pantry… mint chocolate chips. Minty ganache. Perfection in a sauce. This is the perfect chocolate sauce to serve over waffles to make what could be a breakfast recipe into a dessert recipe that everyone will be raving about. We speak the truth. Don’t be a doubter. Heat cream on stove and bring to a boil, stirring continuously. 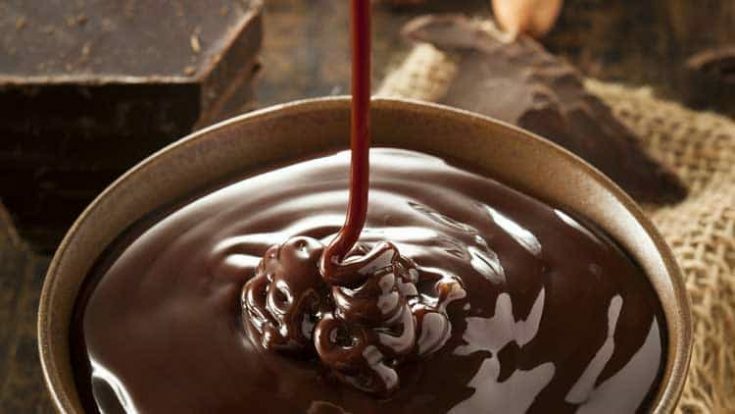 When it reaches a boil, add chocolate and stir until melted and smooth. It will thicken up a little as you stir. We love making recipes with chocolate. It helps that everyone in our house loves the delicacy that is this sweet treat. With just a little bit of creativity and a lot of chocolate, we’re constantly coming up with fun new recipes using one of our favorite ingredients. I love making ganache! It’s so much fun and it tastes so good. This looks yummy & it’s making me hungry.